People who see life as the supreme value have difficulty understanding the mind of the suicide terrorist. Why were so many Palestinians willing and eager to kill themselves in terror attacks against Israel? In order to create willingness among the population to confront Israel violently, the PA took advantage of the ancient tradition in Islam, Shahada or Death for Allah, which mandates Muslims to aspire to die in combat for Islam. The PA told their people that this ancient tradition also applies to them in confrontation with Israel today. This indoctrination began shortly after the start of the PA terror campaign (the "Intifada," 2000-2005) and continues today. The PA promotes Shahada as a mandatory religious Islamic duty, both for adults and children, promising great rewards. The writing of the Prophet [Muhammad in this Hadith]... is intended to fill Muslims with desire for Paradise... to be worthy of it, because only three dwell there: Prophets, Righteous and Shahids (Martyrs for Allah)." The message comes from all parts of society, including religious leaders, TV news reports, schoolbooks, and even music videos. Newspapers routinely describe the death and funerals of terrorists as their “wedding.” The indoctrination has impacted so significantly on Palestinian society that mothers celebrate their sons’ death as “weddings” and some even state that their sons’ motivation to fight Israel and be killed was to reach Paradise and marry the Dark-Eyed Virgins. I have not sold my homelands, and have not given up my assault rifle. Because victory and liberation are coming at the hands of the lion cubs." 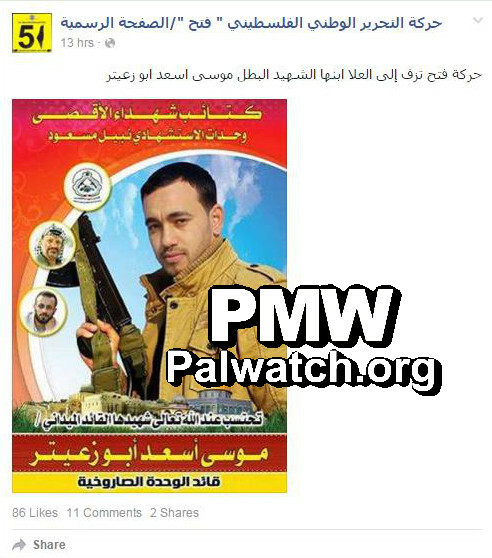 Father of terrorist Hamza Zamaarah: "Hamza is not just my child, he is the son of Palestine. Hamza became a Martyr while defending the soil of Palestine. Hamza became a Martyr while defending the Al-Aqsa Mosque, Jerusalem, and the prisoners. 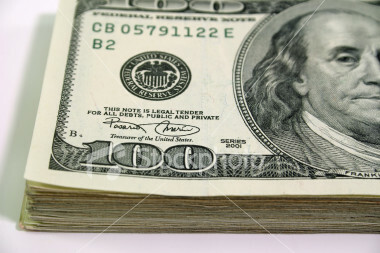 Praise Allah." 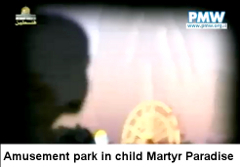 Mother of terrorist Hamza Zamaarah: "I ask Allah to give him the reward of a Martyr. Allah willing, he will be with the prophets, the Martyrs, and the righteous. I greet all the people who came today to accompany my son at his wedding. My son is a sacrifice for the homeland, for Palestine, for Islam, and a sacrifice for all of Palestine." A Martyr's funeral is considered a wedding to the 72 Virgins in Paradise in Islam. Hamza Zamaarah – Palestinian terrorist who stabbed and wounded an Israeli security guard at the entrance to Karmei Tzur near Hebron on Feb. 7, 2018. Zamaarah was shot and killed during the attack by another security guard. “He was known for his strong envy of the large Martyrs’ (Shahids’) funerals, and used to say: ‘I want a wedding similar to these funerals.’ Two days ago (Tuesday, Jan. 30, 2018) in the afternoon what Martyr Laith Haitham Abu Na’im (16) from the village of Al-Mughayyir, northeast of Ramallah, wished for happened when an occupation soldier shot a bullet in his face and he died as a Martyr. Yesterday a big wedding was held, as he yearned for (i.e., Martyr's funeral is considered wedding to the 72 Virgins in Paradise in Islam). Palestinian killed in clashes stated he was hoping to die, because "70 beauties are waiting for me"
Headline: "Saba Abu Obeid: Sound cries of joy if I die as a Martyr"
'The greatest sacrifice a mother can bear is to separate from her son,' said the Martyr's grandmother. She added that one night she stayed awake with his mother, and he took food and sat at the room's entrance... [She said:] 'He asked me to sound cries of joy if he died as a Martyr. I told him: "Everyone who seeks Martyrdom-death (Shahada) is entitled to achieve it, but I want to marry you off and rejoice in your happiness." He told me: "Grandmother, 70 beauties are waiting for me in Paradise, why should I replace them with the women of this world (i.e., Islamic tradition teaches that a Shahid [Martyr] marries 72 Virgins in Paradise)?'" Saba Nidal Abu Obeid - A 23-year-old Palestinian rioter who took part in large violent clashes with Israeli army forces at Nabi Saleh, northwest of Ramallah, on May 12, 2017. Abu Obeid threw rocks at the forces and in response they shot and wounded him with a small metal Ruger bullet, which is considered to be non-lethal and meant for crowd dispersal. Abu Obeid later died of his wounds. Fatah-run Awdah TV, video clip of the song “Al-Aqsa Has Called” by Egyptian singer Muhammad Fouad that was released in 2000 during the PA terror campaign (the second Intifada, 2000-2005). Speech by Yasser Arafat: They [the Israelis] want me captive, exiled or dead - but I tell them: [I will be] a Martyr! Martyr, Martyr, Martyr. 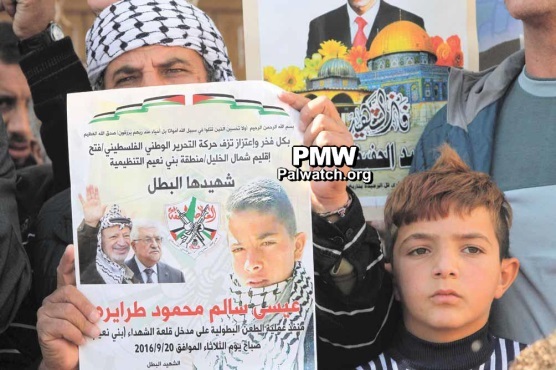 The article includes a picture of participants of the procession holding a poster with pictures of Yasser Arafat, PA Chairman Mahmoud Abbas, and terrorist Issa Taraireh. Issa Taraireh – 16-year-old Palestinian terrorist who attempted to stab Israeli soldiers at the entrance to Bani Na’im east of Hebron on Sept. 20, 2016. The soldiers shot and killed Taraireh. Taraireh is a relative of Muhammad Taraireh, who stabbed and murdered 13-year-old American Israeli Hallel Yaffa Ariel as she slept in her bed, in her home in Kiryat Arba near Hebron, on June 30, 2016. 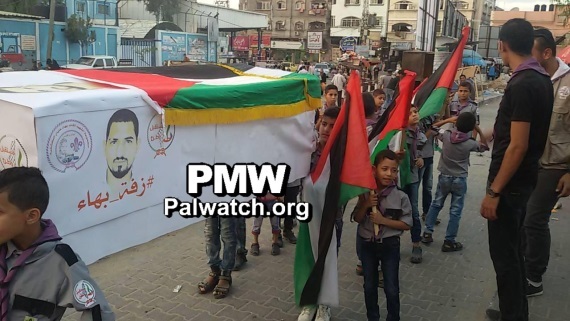 Picture shows the symbolic funeral for terrorist Baha Alyan that was held in northern Gaza. Our souls are the sacrifice for the Al-Aqsa Mosque"
Abd Al-Malek Saleh Abu Kharroub and Muhammad Al-Kalouti – 19 and 21-year-old Palestinian terrorists who shot at a bus at the Ramot Junction in Jerusalem, and then shot at Israeli policemen near the Damascus Gate in the Old city of Jerusalem, injuring one Palestinian man, on March 9, 2016. The Israeli policemen shot and killed Kharroub and Al-Kalouti. 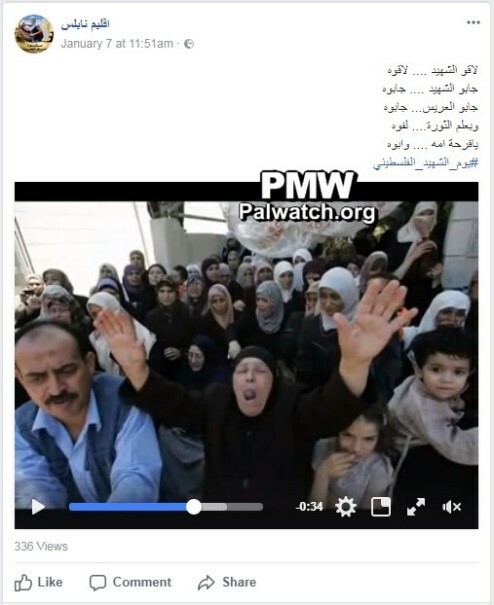 Mother of terrorist doesn’t mourn his death, "as if accompanying a groom to his wedding"
“Without shedding a tear, as if accompanying a groom to his wedding, and speaking in great detail, as if discussing something ordinary with her neighbor – this is the mother of Martyr (Shahid, i.e., terrorist) Mansour Shawamreh who received her son’s body that has returned from the occupation’s freezing refrigerators. Mansour Shawamreh and Omar Amr – 20-year-old Palestinian terrorists who shot at Israeli police next to the Jerusalem light rail stop by Damascus Gate. 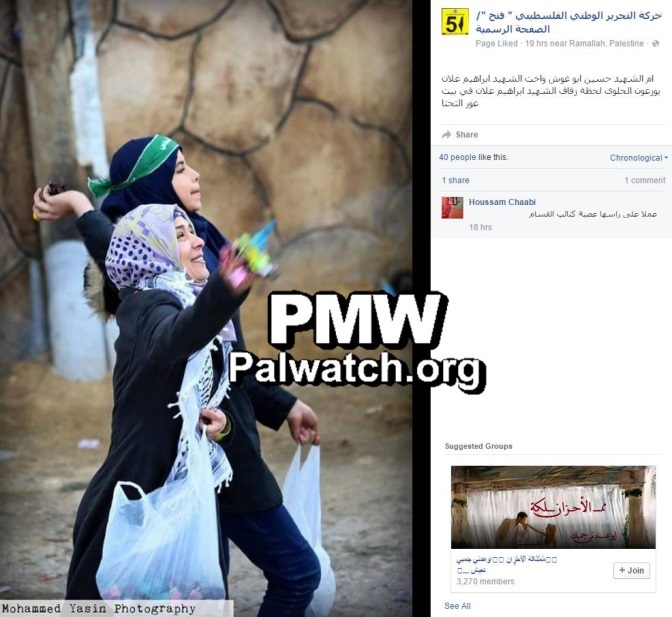 Shawamreh and Amr were shot and killed by the Israeli police. Official PA TV News broadcast funeral of terrorist Abed Hamed who was shot and killed by Israeli soldiers after trying to ram his car into them at the entrance to Silwad, north of Ramallah. Abed Hamed – 22-year-old Palestinian terrorist who tried to ram his car into Israeli soldiers in Silwad, near Ramallah, on Feb. 19, 2016. He was shot and killed by the soldiers. - The body will be carried in a military procession that will leave from the Beit Jala Hospital at 9:00 a.m.
- The Martyr’s body will be taken to his birthplace Al-Ubeidiya, to the house of his relatives, so that they can bid him farewell. 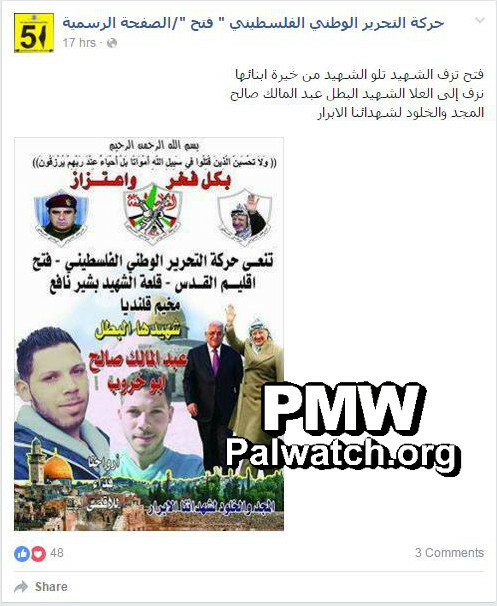 Official PA TV News broadcast – a report about the funeral of Ibrahim Allan, one of the terrorists who carried out a terror attack in Bet Horon and killed a 23-year-old Israeli woman. Ibrahim Allan and Hussein Abu Ghosh – 22 and 17-year-old Palestinian terrorists who stabbed and injured 2 Israeli women outside a grocery store in Beit Horon, between Modiin and Jerusalem, on Jan. 25, 2016. One of the women, 23-year-old Shlomit Krigman, died of her injuries the next morning. 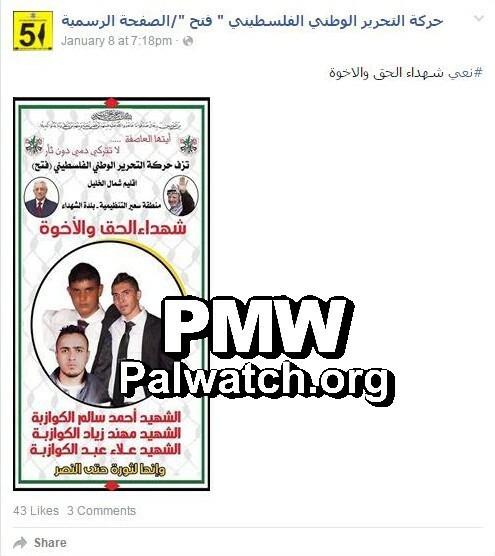 Allan and Abu Ghosh were shot and killed by a local civilian security guard. Musa Abu Zuaiter – 31-year-old Palestinian killed in an Israeli military raid on a terrorist cell responsible for laying land mines along the security fence in the northern Gaza Strip. 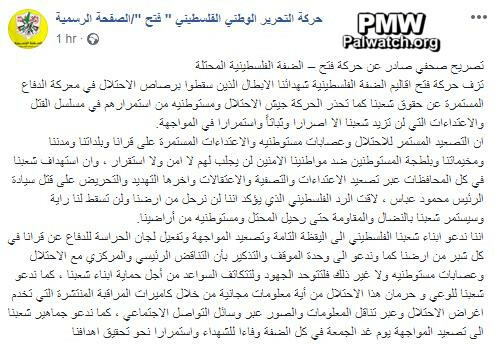 The terror organization the Al-Aqsa Martyrs’ Brigades (Fatah’s military wing) say that Zuaiter was the head of their rocket unit. 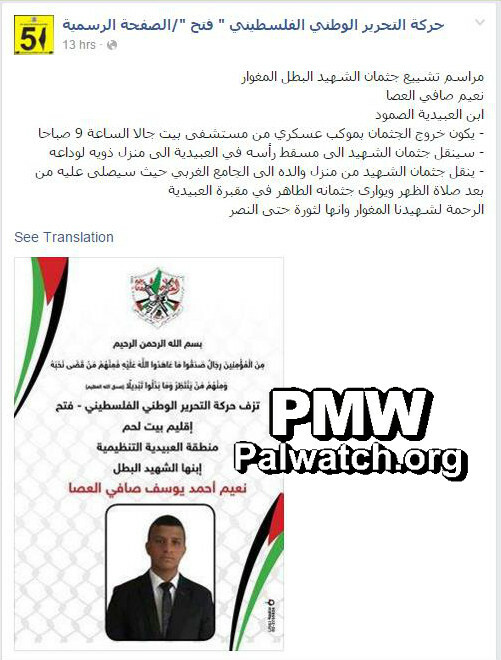 Fatah posts death notices of 3 terrorists: "Fatah's northern Hebron branch accompanies the Martyrs of justice and fraternity to their weddings"
"Al-Asifa" – “the storm” was a pseudonym for “Fatah” in its first years. It later became the name of Fatah's military wing in the 1960s and 1970s. Ahmad, Muhannad, and Alaa Kawazbeh – 3 Palestinian terrorists, 18 and 19-years-old, and relatives, who attempted to carry out a stabbing attack near the Gush Etzion junction on Jan. 7, 2016. They aroused suspicions of Israeli soldiers at the junction who began a security check on them. The Kawazbeh relatives pulled out knives and were shot and killed by the soldiers.